Makanya is approximately 90 miles from Moshi Town and a three hour drive from our base while in Tanzania. As we approached the school large signs advised us we were in a high risk malaria zone. The area is very barren and the poverty acute. Jim is a regular worshipper at St Margarets Church, Durham and when they were looking for ways to celebrate their 850th Anniversary he suggested they may want to raise money for a Well. 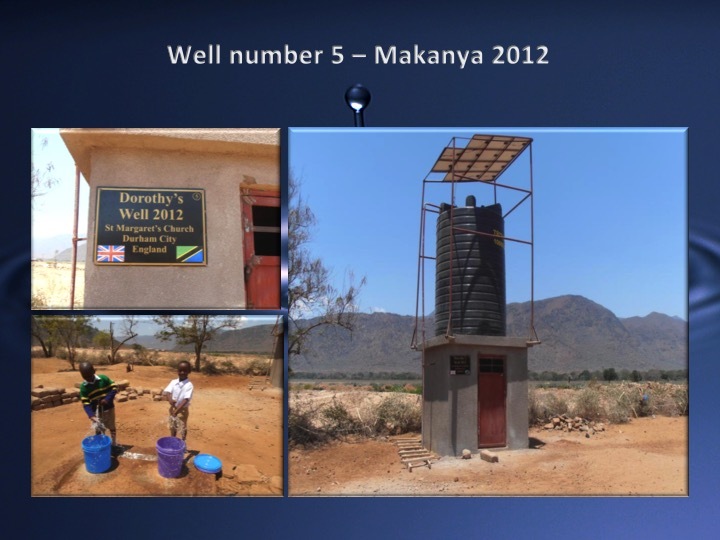 Following a year of fundraising they presented a sum of money to the charity which enabled us to go ahead with this project so the well was named for the church. A Solar pump, 10,000 litre tank with solar panels and standpipes and taps was installed and serves 750 children and a community of 4000 people.